Labor Secretary Tom Perez, one of Hillary Clinton’s top choices for vice president, misrepresented his grandfather’s relationship to a Dominican dictator, according to a report. Perez has lauded his grandfather, Rafael Brache, for "standing on the right side of history" against the brutal regime of Rafael Trujillo in the Dominican Republic. He said that Brache was expelled for speaking out against the regime, but a new Wall Street Journal investigation revealed that Brache exited the country after years of support for the regime. "In his comments, Mr. Perez rarely, if ever, mentions that Mr. Brache was one of the dictator’s champions during at least the first five years of his repressive three-decade regime, a fact documented in dozens of cables, letters and memos in public archives in the U.S. and the Dominican Republic," the article states. "In addition, Mr. Perez testified in 2013 at his Senate confirmation hearing that his grandfather ‘was declared ‘non grata’ for speaking out against the dictator following the brutal massacre of thousands of Haitians’ in 1937. But in fact, Mr. Brache had left the Dominican Republic about two years earlier, according to State Department memos and media accounts at the time." Memos from the State Department reveal that Trujillo was angry at Brache for his inability to get a loan. A friend of Trujillo referred to Brache as a leech. "After serving in Britain and as treasury secretary under Trujillo, Mr. Brache returned as U.S. ambassador in 1934. He fell out of favor for reasons that aren’t entirely clear, and Trujillo replaced him as ambassador in late 1935, the records show," according to the Wall Street Journal. Brache attempted to defend himself to Trujillo, according to a 1935 memo from a U.S. diplomat. However, a 1936 memo declared that Brache became part of "the ranks of the political enemies of" Trujillo. 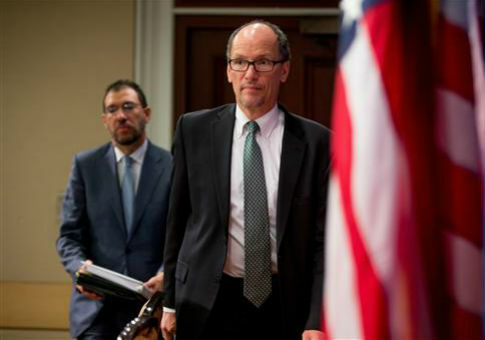 A Labor Department spokesperson told the Wall Street Journal that Perez was simply passing on the story as he heard it from his family. This entry was posted in Uncategorized and tagged Hillary Clinton, Tom Perez. Bookmark the permalink. Victoria Stroup is a Free Beacon summer intern.